Until the end of January 2017, people and the economists of India were also prefacing Social Trade as the fastest growing business in India. Every associate or customer of social trade biz was happy on the kind of service they are getting from socialtrade.biz or from the frenzzup or Ablaze. But from the earlier February 2017, everything is messed up when complaints raised up on this company and when the man behind this company Anubhav Mittal got arrested by police. The law of our nation has abducted him and judging the action he did to the people is legal or not, but still, so many people who ever could make money from this business are supporting him as much as they can and they are demanding to free Anubhav Mittal and let him continue social trade again. So many people got profited from this business who had invested at the initial stage of social trade, but so many have to lose their money on it in the later stage. If you are also involved with this and have no idea about the money you have invested in it and about the company then follow this article, we have discussed everything about social trade biz and the ponzi scam. 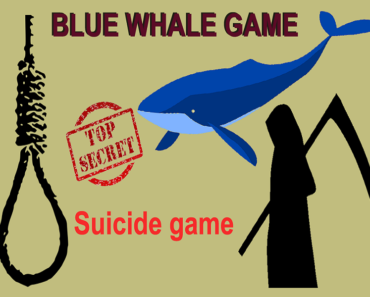 Latest unbiased news about the case going on social trade will be updated here periodically. 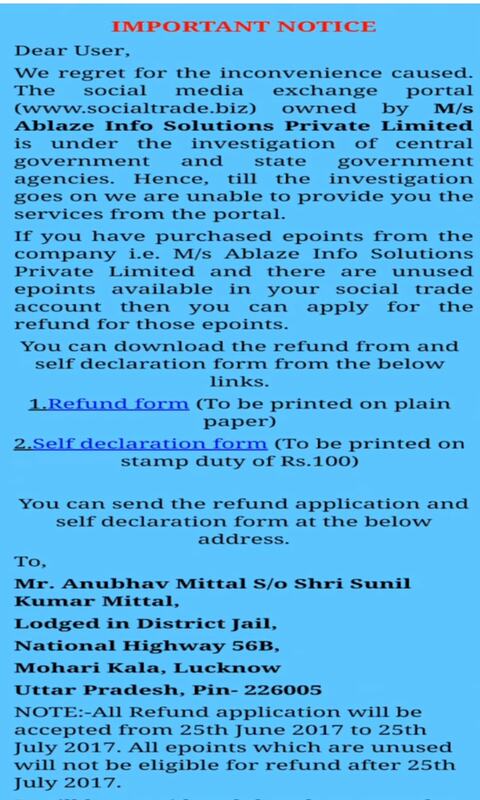 We have mentioned here the refund process of socialtrade, how to get your money back? Final Court hearing on this scam is going to be held on 8th September and we will cover everything on that. Last hearing on this ponzi scam case was held on 20th September, In which no considerable steps have been taken. Till now 26 hearings have been processed on this case since 15th February. Next hearing will be on 4th December 2017. Refund form to get the money back has been introduced. 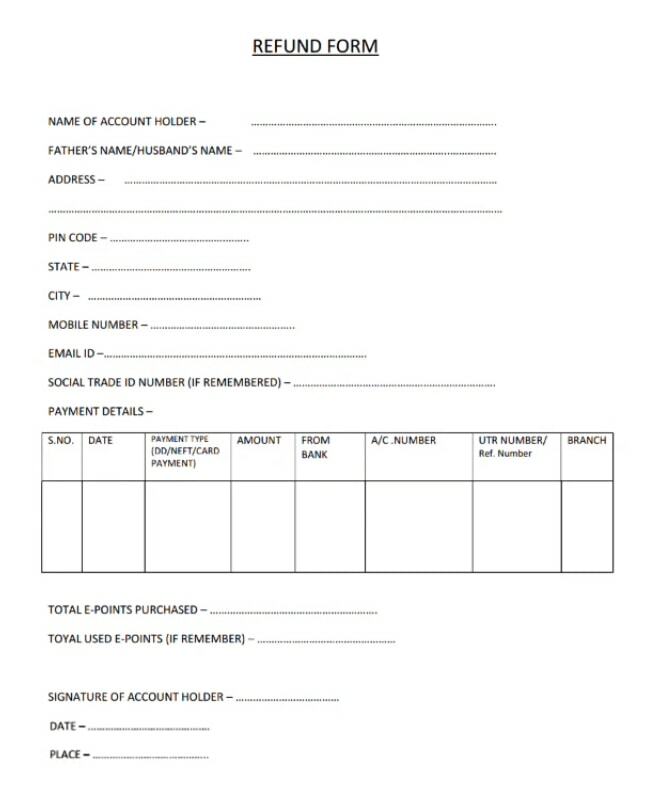 People who have to claim their money from Social Trade has to simply fill this form and send that to an address given by social trade biz along with a declaration form made on a stamp paper. We have discussed the “step by step process of claiming the money back” in details below in this article. Some sources saying that Anubhav Mittal came out from the jail and trying to fly out of the country. But this is not trusted, He is still in the jail and even though the application for his bail has been granted he is in custody for the investigation purpose. Justice Narayan Rao commented on this case and said the court will give the final decisions quickly and that will be in favor of common people. He said justice will come soon to everyone. After getting arrested Anubhav Mittal conveyed a message to his associates to be patient. By being positive, he said that he will come back and continue this business again. He demands this criminal case will get more popularity for him and his company. On 2nd February 2017, Anubhav Mittal, Shreedhar Prasad(CEO of the company), Mahesh Kumar(Technical Head) got arrested by Special Task Force(STF) of Utter Pradesh. Later on 12th May Sunil Mittal, father of Anubhav Mittal who is the Director of the company got arrested from Navyug market in Ghaziabad. The wife of Anubhav Mittal is missing who is also a Director of one of a company of social trade named Ablaze info solution private limited. Social Trade was accused of scamming 3700 crores rupees from 7 Lakh People of India. The case was filed by STF(Special Task Force) under PMLA (Prevention of Money Laundering Act, 2002). Police seized 500 Crores from 14 bank accounts of Social trade and property of Mittal worth of 64 crores. The supporters of Social Trade were united and organized a Candle march on 12th February at Jantar Mantar Delhi to state their solemn support for Anubhav Mittal. However..Social Trade is not going to start again. It is reported and filed for a big internet scam. Not all but most of the allegations against social trade have been proved right in court. So there is no chance that this company can do business again in this country, all of the websites associated with it are also banned. But some of the people who have registered in this company for business can possibly get their invested money back. Read the details below to know everything about SocialTrade and about the refund form. 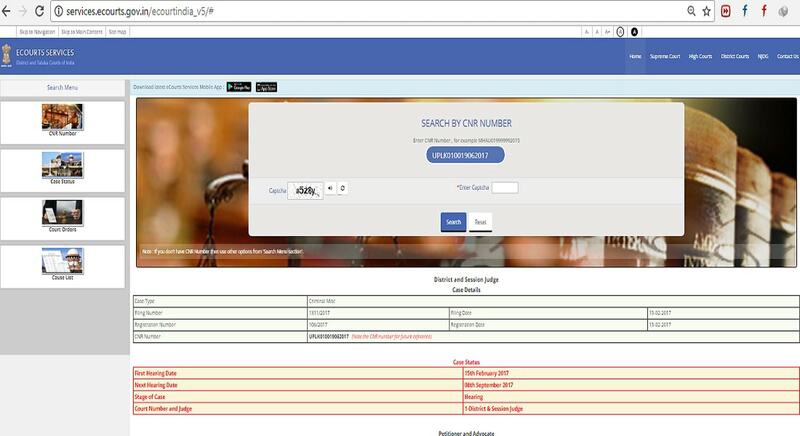 There is a Government website which shows detail status of any pending case in Indian courts. You can check the status of this Anubhav Mittal case also by that site. We will provide you the CNR Number of the case registered against the social trade. See the steps below to check the case status. Go to services.ecourts.gov.in portal. or simply click here to get redirected. Enter this CNR and then fill up the captcha box and then click on search button. Then scroll down to see all hearing history and interim orders there. You can also click on each hearing date to see the details. 4.1 How to join STIDA ? 7 How Social Trade become a Scam ? 7.1 How is it exposed? 9 Who is Anubhav Mittal ? 10.6 SAY NO TO SHORTCUTS!! On June 2017, there was a notice published on the official site of Social trade www.ablazeis.com. On that notice, it was stated that if you are a registered user of SocialTrade.biz and if you have unused e-points which you had purchased during subscription, then you can apply for the refund. See the notice below. Many people did not believe in this notice because of the address is given in this notice and where we all are instructed to send our documents is the address of the jail where Anubhav Mittal is imprisoned. It’s not an address of social trade office or the address of the investigation team. So a question may arise on that. According to this notice, you have to download two forms. Refund Form: As the ablazeies.com site is not opening, At this time you can not download any of the forms. Here I am providing you the same refund form which I had downloaded on earlier July. Click on the form and save it if you need it for any purpose. 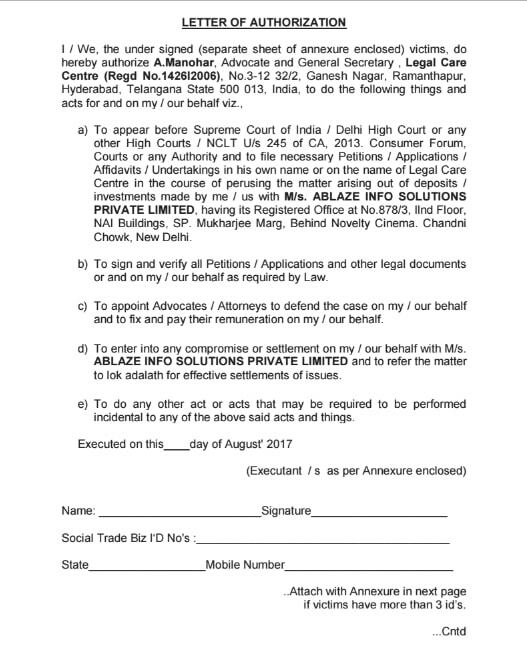 Self Declaration Form: This is a format given by social trade official which you have to print on a Stamp paper of RS 100. Here I am attaching the declaration form format. Save this form if you need. According to that notice, you have to prepare these two documents and send it to the address given in that notice between 25th June to 25th July. So many people have sent these form in order to get their money back. The official sites of Social trade are not opening, so we can’t see the further notices from social trade. But if you are a victim of social trade and want to get your money back then I will suggest you fill these two forms according to the guidelines and send it to the address given if you have not sent yet…..!!!! When the company is in legal proceeding all you can do from your side is follow the instructions. Let’s send the refund forms, and wait for the hearing to come. Most of the sources are saying that the people who have registered after 23rd January 2017 may get their money back. They are saying this because the police have been seized 500 Crores rupees from 14 bank accounts of social trade, that money came to the social trade bank account from the people who had registered after 23rd January. After this period the company has not transferred or utilized money from their bank accounts. So it can be confirmed that 500 crores money seized from the bank account belongs to the people registered new to this company. But it can be difficult for the company as well as for the government to refund money to the people who are old customers of the company. STIDA is flashing in news nowadays. It is organizing meetups in different cities and trying to unite the victims of this Social Trade company. Its next meet is going to held in Bangalore on 10th September. At NATYAPRIYA School of Performing Arts (Kasturi Ranga Mandhira ), 310 2nd A Main TC Palya Main Road, Hoyasala Nagar (near Sri Rama gas agency), Bangalore – Karnataka.Time: 2.30 to 4.00 PM. STIDA has hired a Law firm which is going to file a case on behalf of the entire STIDA member on the court. So they are requesting all the victims to join them in this process. They have mentioned on their website that they are not forcing anyone to join, but whoever interested in it can join STIDA and file case against Social trade biz in a group. This organization has hired a law firm and engaged a senior advocate Mr. Anguru Narayana Rao to deal with the legal procedures. You can also join STIDA and claim your money if you are also a victim. But you will have to pay fees for this. STIDA is a non-profitable organization. But it is collecting some money from all the people who want to join with their agenda to carry out the legal expenses and the law firm fees. We will discuss below that how much fees is it taking from individuals..!? How to join STIDA ? This process is pretty much simple as applying any other things. You will have to download the forms, fill those up, then send it to the address of STIDA with pay slip and all your documents. On the official website of STIDA, there are links to download forms. There are two forms you have to download. I am also attaching those forms below. Click on it and save it if you need. Download these two forms and fill up. By signing in on the Authorization letter you are giving the authority to STIDA to proceed the case against the company on behalf of you. 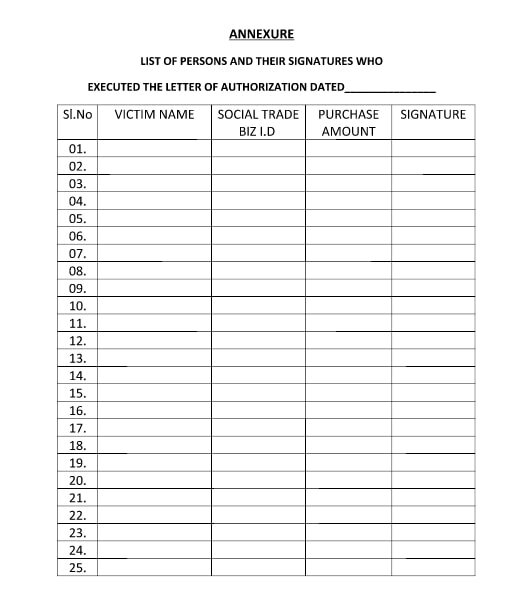 And in Annexure form, more than one victims can sign and forward without filling the forms again. Victims who are physically handicapped, deaf and dumb do not have to pay any fees if they will provide a proper certificate of their disability. You have to deposit or transfer the given fees to the bank account of the law firm. You will have to attach your pay slip or Screenshot of net banking transaction or any other proof of transaction along with your documents. Xerox copy of Bank statement or any receipts showing payment proof made to Social Trade Biz (self-attested ). Photo ID proof (xerox copy of Aadhaar card or Driving Licence or Voter id card) – self-attested along with separate address sheet. (if any upline member having 3 or more downline, address of upline member is required and no need of attaching address of every downline member). Letter of Authorization and Annexure duly signed. You can call the phone numbers given below if you have any queries about STIDA or if you faced any problem or doubt while filling the forms of STIDA. Social Trade is a business scheme introduced by Anubhav Mittal in August 2015. Initially, he was running this business through a company named Ablaze info solution private limited. The director of this company was his father Sunil Mittal and he was the Managing director of this company. After his marriage, his wife Ayushi Agrawal became the additional director of Social Trade biz. And Expanded its business and customer base. its main office is at Noida and 100 employees were working in that office when he was arrested by Special Task Force of Utter Pradesh police. 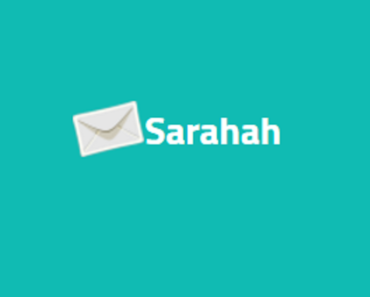 It is a social marketing portal, where you can earn money by clicking on some web links, liking Facebook pages and posts, participating in online surveys and much more. You will have to register with it by paying the registration fees. After registration you will get links by email or message and all you have to do is click on those links. Per click, you will earn RS 5. But you can click maximum the number of links that sent to you by social trade. To get more links per day you will have to get bigger plans of social trade biz. Plan of RS 5750: People who activate this plan gets 10 links daily. Its validity is 1 year. So per day one can earn 50 rupees and in a year one can earn total Rs 18250 by paying only RS 5750. Plan of RS 11500: This plan enables 20 links to their customers per day and valid for one year. So one can earn up to Rs 36500 by paying only 11500/-. Plan of RS 28750: People registered with this plan were getting 50 links per day and this subscription is valid for one year. Plan of RS 57500: This plan was providing 100 links per day to their registered customers by which they were earning RS 1000/- daily by clicking on those provided links. There are three types of income in social trade. We have discussed the ads click income. Let’s go to the Booster and Binary referral Income. Booster is a process in which you will have to add two people under you within 20 days of the activation of your account. Once one could get the booster he gets several bonus and benefits from social trade. It’s like a reward. Binary referral is simply MLM process. By which you will get some percent of the earning of the people who are added to you. You can earn more if you could add more people under you. This business had spread like fire over the whole nations. Lakhs of people registered with it. Everyone was curious as well as fascinate about this as they don’t have to work hard in this business and they have flexibility about the working time and working place. Means they can work on anytime they want from anywhere. Social trade has also MLM plan. i.e Multi-Level Marketing plan. If one existing customer will convince another one(Maybe one of his friend or family member) to join Social Trade biz then he will get rewarded. He will get bonus income if anyone got added to the social trade with his reference. Also, he will get some percentage of the money what the persons under him will earn. This MLM program made all the social trade associates work hard to make the network even bigger than what it was. All the associates could earn by adding his/her friends or relatives in it. Frenzzup is a social media site introduced by social trade and was under 3W digital private limited. Its head office is in Noida. The websites of frenzzup are frenzzup.com and frihub.com. It is banned after social trade scam exposed. It was very similar to FaceBook. you can make friends on frenzzup, like or share post appears on your timeline. Can upload pictures, videos and also can update status on Frenzzup..
Chat with friends on Frenzzup is also possible. You can also create business pages on it. The advantage of frenzzup is you can also earn from it by liking or sharing the post on your timeline and by liking some pages. It was not working on MLM but earning was possible by this. Frenzzup also marked as a scam as the links they were providing on frenzzup were not any links of ads. Those are worthless and fake. The money they were giving was the money collected from others as registration fee. How Social Trade become a Scam ? The company was doing well as well as the customers. Initially, every customer was getting paid weekly once he has registered and click on the links sent to him. But how the company was earning…??? Social Trade was telling to their customers that they are earning from the internet. They have advertising companies and they get paid for each click their customers do in a web link of ads. But in reality, they were not earning anything from anywhere. They were just circulating the money they were getting from the customers as the registration fees. This way it was fooling people around and making a strong customer base by MLM business. The advertising links they were sending to their customers were not the genuine one. Every time a link was clicked it was opening a new tab which existing for 30 seconds only and then it was getting closed. This activity increases the bounce rate of the website whose link it was providing. Bounce rate is calculated from the average time viewers stay on a web page. If the Bounce rate of a website will be high then it’s ranking in the search engine will go down. As social trade was increasing the bounce rate of several websites, those websites started banning social trade. Even facebook also banned social trade because of its suspicious activities. When it started banning from different websites, it could not provide the required number of links to its customers. And then customers started complaining about it. Also, Ablaze Info Solution was transferring huge amount of money from its bank account to the account of new companies of Social Trade, like 3W digital, Intmaart India etc. This huge amount transaction caught the attention of STF. It was doubtful that how a company can earn this much of money within very less period of time. The reason behind this huge transaction was found out as that Mittal was transferring the liability of Ablaze info solution to the New companies, So that in future when customers will complain, they can only complain about the company whom they had paid, that is ablaze info solution. And the other companies will not get affected by this. STF(Special Taskforce) then started the investigation about Social Trade Biz and found that this company is not really earning from the ads. It was just fooling people by circulating their own money. On February 2017 STF filed a complaint under PMLA (Prevention of Money Laundering Act, 2002) and arrested Anubhav Mittal and 2 other chairpersons of Social Trade biz on 2nd February. Then the legal procedure has been started. Later on 12th May his father and the Director of social trade Sunil Mittal was also arrested. 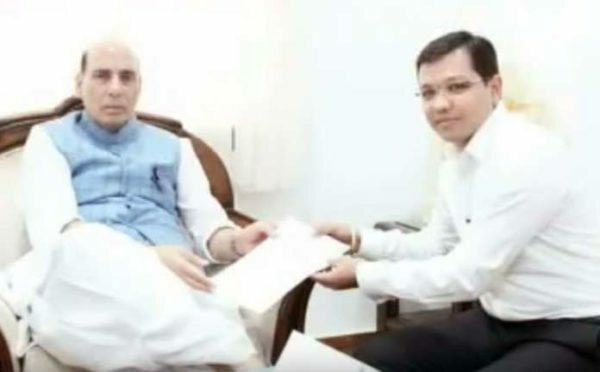 STF also arrested Atul Mishra, a Relationship Manager of Yes Bank who was helping Anubhav Mittal in this conspiracy by secretly providing the account details of others and so many transaction reports to Anubhav Mittal. People who were earning from social trade are blindly supporting Anubhav Mittal. They are certain that we could earn from it means this is a full proof and genuine business plan. Social trade has managed to own the trust of common people. few people are not ready to agree that social trade is a scam. People are forwarding different different messages on WhatsApp or in other social media platform in a support of Anubhav Mittal. Some people are describing him as a god to them. People are saying that all the news channels and media are paid against Anubhav Mittal and they are trying to get him down. Where the fact is anyone who has knowledge of internet world can easily understand that social trade biz was a pure scam. Some people are ready to face the whole world for him. They are saying that they are ready to die for Anubhav Mittal. Some people are trying to prove it as a political conspiracy. They are saying that it’s a game of selfish politicians of our country who never want the development of the common people of our country. On 12th February the supporters organized a candle march at jantar Mantar delhi to support Anubhav Mittal. But the people who do not believe social trade blindly and analyzed all the facts could understand that a business plan like this is simply impossible. No company can start earning in crores in few months. Some sources are saying that Anubhav Mittal has come out from the jail and flew out of the country with all the money. But this is also not possible. Even He has applied for the bail and the bail has been approved, he is still inside the custody for the investigation. And the money he has is now in the observation of STF. He can’t just fly away with that money. Many different discussions are taking place by the different group of people about social trade biz. The exact and confirmed news is still out of reach of us. As he is in police custody, no one can record his voice or take a photo of him. One person named Gulab Chourasia, an associate of social trade recorded a video of Anubhav Mittal from the window of the cell where Anubhav is imprisoned. There in that video, Anubhav Mittal addressed to his associates that be patient, I will come back soon and continue social trade. Later that video became viral on social media and then Gulab Chourasia arrested by the cybersecurity department for shooting a video of a person who is in police custody without any prior permission. Who is Anubhav Mittal ? On 2nd February 2017, Anubhav Mittal was arrested for swindling Rs 3,700 crores from 7 lakh individual people of India. He was the mastermind and the Managing Director of Ablaze Info solution private limited which was operation Social Trade Business. Anubhav Mittal is a resident of Pilkhuwa, Utter Pradesh, India. He is only 26 years old now. His Father’s name is Sunil Kumar Mittal who is also got arrested as he was one of the directors of Ablaze info solution. Sunil Mittal has a small Electrical shop at Kishanganj Mohalla of Pilkhuwa Town, Utter pradesh. His grand Father Ved Prakash also runs a grocery shop. From this, we can understand that he belongs to a very common family. But this ordinary Person did really an extraordinary scam of 3700 crores so smartly that the system of our country also could not smell that out. Anubhav Mittal is an activist and a hero on social media. He has facebook pages which are filled with many motivational quotes and videos. He is a modern-day inspirational entrepreneur who started so many companies and websites with many unique business ideas. He completed his schooling at KMS Public Inter College, Pilkhuwa which was nearby his home. Later he completed his graduation in B.Tech with Computer Science branch from Skyline Institute Engineering and Technology which is at Greater Noida. After that, he did MBA in finance from IMT – CDL(Institute of Management Technology Center for Distance Learning), Ghaziabad. Anubhav has also done diploma in VLSI and Embedded System. He has knowledge of Photoshop, Marketing, Ethical Hacking etc. So basically he has knowledge in almost every field and he is a proof IT field. He said that he was called as Phunsukh Wangdu by his friends at his college. Phunsukh Wangdu is a famous movie character of 3- idiots movie played by Amir Khan who was an uncommon student with so many practical knowledge. Anubhav Mittal has different mental state than others who think to get a job either in public sector or in private sector after graduation. He was determined to start his own business. That is why he had registered his very first company when he was in his graduation course on 2010. It was Ablaze info solution private limited. He had registered this company on the address of his hostel room which was at park area, Noida. Primary work of this company was software development. Initially, for 3-4 years his company could not make the profit as much he had expected. But on August 2015, Anubhav Mittal rearranges the company with a brand new idea. He started Social Trade Business and started socialtrade.biz website under Ablaze info solution. And his hard work became fruitful at the end. More than 7 lakh people registered with him within 18 months only. No company could get that much popularity in this much short time period. He likes to live a Luxurious life with all the material things. He owned so many Fancy cars. During the interrogation, he spoke to STF that he has more several flats in reality firms. Anubhav Mittal likes to spend a lot of money in parties. He invites Bollywood celebrities to his Birthday parties to cheer up the participants out there. Social Trade chief Anubhav Mittal has married Ayushi Agrawal and made her additional director of Albaze info solution. When his growth was challenging every business record of our country, he was arrested on 2nd February 2017 for the complaints filed against him of money laundering and scamming 3700 crores of rupees from over 7 lakh citizens of India. He has been charged with Cheating, Breach of trust, forgery and criminal conspiracy. According to Indian Constitution Anubhan Mittal was accused of more than 5 cases. But three of those were denied and the rest two cases left on him are the IPC Sections 420 & 406. Section 420 is for Cheating and dishonesty. He may have 7 years of imprisonment and liable to some fine for this section. Section 406 is for Criminal breach of trust. He might have 3 years of imprisonment or will be fined or may have the both for this charge. Till now there are more than 10 hearings are made by the court. But the case is not yet decided. Investigation agencies need more time to dig out the root of social trade. Next hearing will be on 8th September 2017. Justice Narayan Rao conveyed the people that the result of this case will come soon and that will be in favor of people. When Anubhav Mittal was arrested, his supporters start telling that the SP party of UP has framed this case to hunt down Anubhav Mittal. Because he has a good relationship with BJP party of India. There is no such valid proof that states Anubhav was being supported by Bhartiya Janata Party. But there are some pictures on social media where Anubhav Mittal was with some great leader of BJP. One of those pics is Anubhav Mittal with the Home Minister of India Mr. Rajnaath Singh. This picture was taken on the occasion where Anubhav Mittal was handing over a donation of RS 10,00,000/- towards Indian Army. 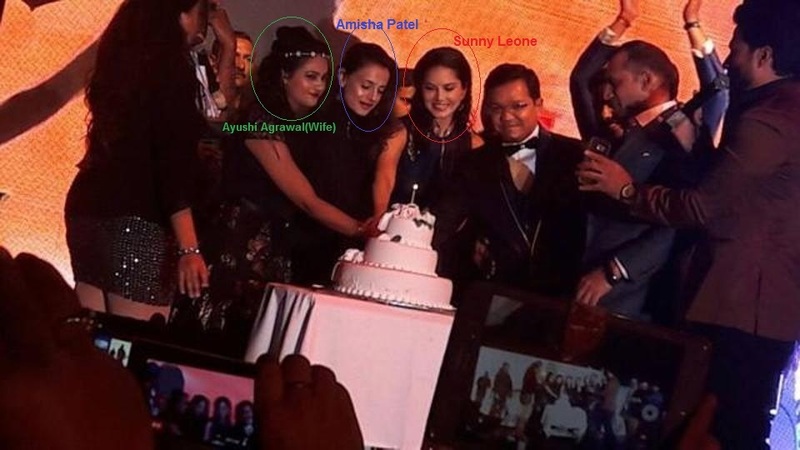 On a birthday party of Anubhav Mittal, Bollywood stars Sunny Leone and Amisha Patil were present. The party was on 29th November 2016 in Delhi. Investigation department said that till now there is no proof that state these two Actresses are involved with Social trade biz. But they might be interrogated if needed. This is a scam you believe or not….!!!!! I can say that any online business which is demanding money for registration might be a scam. You can work any time of a day when you are free. There is no qualification needed. You don’t have to submit the certificates for verification. There is no workload. You can work how much you need to. You will be the boss. But in reality, this is hardly possible to get all these facilities at a time. The online job basically targets the college-going teenagers, who have a lot of dreams to fulfill. And they think that if they could earn online then they will buy all the things they are fascinated about, like a video game, fancy dresses, bike etc. They are not matured enough to understand if a business scheme is a scam or not. So they can be trapped easily. I personally will suggest don’t go for these online jobs at all. Try hard to make things by yourself without looking for a shortcut. Read below how do you have to be aware of the scam and how to find out a wise investment opportunity. Investments scams are spreading like a virus nowadays. We all are becoming the victim of it day by day. 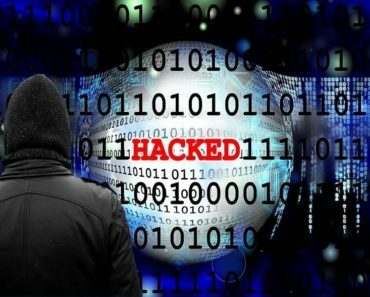 Sometimes in a good intention to make money or sometimes a hidden temptation to be a millionaire overnight or sometimes it’s just the bad luck…Be whatever the reason is but losing money to fraudsters is like the worst nightmare to anyone. No matter how much experience and confidence you have with investments and finances, you could still be at risk. But if we will spend a little bit of our time in research and analysis them we can easily save ourselves from being a victim of it. There is no special hat they wear that they can be easily recognized. The fraudsters may be good at their game But if we will pay attention then we probably find out that there are so many signs they through which is enough to say “NO” to such people. These fraudsters often show a get rich quick approach or they call it phantom riches..!!! Scammers usually use this tactic to pamper people and get their money. What they do to people is, they fake an emotional desire to solve their financial issues by offering them a tempting opportunity of being rich within a very short time frame. But Is not it too good to be true?? So when suave, smooth-talking scammers at the top of their game come to you with such approach. Hold on a minute before jumping up to such lavishing offers. Don’t ever dare to trust someone who says you will get handsome amount of returns without any risk in investments. No such things do exist in the investment market. Undoubtedly there is an opportunity to earn money in investment market but the area of the investment world is massively competitive. And an assurance of risk-free high returns is weirdly unbelievable. Be aware, it’s a major sign of deception. Rushing you to be the commitment to their schemes is another sign of being a scan. With such tactic scammers manipulate the person to act immediately. They will play it like” the offer is limited and needs an instant response or commitments”. This is another tactic by them to trap people. As by doing this, they leave people with less time to investigate or to conduct an inquiry about the scammer or the scheme. When such high-pressure situation arises, refuse to be rushed. Here is how they play the master stroke “Everyone is doing this” and this line is more tempting than anything else. The fact is everyone follows the mass and that is how people get trapped. When the Person says so don’t fall for his words. Do a proper homework first. Even if everyone is drowning, you are not supposed to do the same stupidity. Do You?? When any special tempting offer comes knocking your door, be double sure before accepting it. Sometimes what fraudsters do is they mislead people saying “this special offer is only for you and don’t share this with anyone else”. This is another way of pampering people to do the investments. Step out from such opportunities. This is another deceptive way to trap people. Be aware of abroad or offshore investments or offers coming from abroad locations. Most of the time it’s nothing less than a scam. If merely a stranger from a foreign land offers you undeniable investing offers then it’s not even worthy of a second thought. Time to show a red flag to them. Avoid when the salesperson comes to you demanding your personal account details such as; bank account number, credit card number or any of unnecessary personal account details. In such cases walk the other way and avoid investment. Whenever anyone is asking your money for investment, a background check is a must. And be careful enough to say NO to unregistered private investments which promise an outsized return. You can watch out for investments which cannot be verified through the Securities and Exchange Commission (SEC) or the National Association of Securities Dealers (NASD) registration process. Well, when people usually lose their money in this way they don’t report or talked about as they feel embarrassed about it. But whenever such misfortune happens rather than being ashamed, people should report that. Then only you can do anything to punish the guilty. Overnight millionaire is a myth. It’s an illusion we need to get over from. Although nothing wrong in seeking a smart way to make money but seeking shortcuts and trusting such people will lead you nowhere. There is no replacement of hard work and shortcuts are deceptive ways. So stay Careful and Work hard.